The new Mazda CX-3 was designed to turn heads from near and afar. Its muscular build and clean lines along the side panels make it a sporty option right out of the gate. What truly sets the Mazda CX-3 apart from other vehicles in its class is the thoughtful layout of the interior space. There is an option to select Lux Suede trim to take elegance to a whole new level. The streamlined approach to the display and buttons helps you to de-clutter from the stress of your daily commute and truly relax while driving. The audio system is also top-notch and features advanced speakers that surround you with crisp, clear sound. You'll have cargo space to spare in this sophisticated crossover. 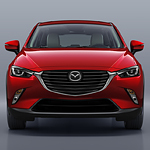 Visit Tim Short Mazda in Chattanooga to talk with the friendly staff about the amazing design features of the Mazda CX-3 and schedule a test drive of your new favorite vehicle today.